The weekend before this last one was a quiet weekend at Barry's house in Woodland. We had originally planned to spend it at my house in Marysville, but then Barry's board-gaming friends suggested a game day that Sunday, so we spent it at Barry's house. I arrived to find that Barry had just bought a gigantic new TV, 65 inches across. It came in an even more gigantic box; the box filled up pretty much an entire wall of a room. Barry is giving me his old TV, because my only TV at the moment is an ancient CRT one, which Barry seems to like for its nostalgia value (he plays similarly antiquated video games on it), but which is useless for actually being able to receive any TV stations. We are thinking of putting Barry's old flatscreen on top of my fireplace mantle, but we haven't transported it to my house yet. Barry is also giving me a Playstation 4 to use with it, because apparently he had an extra Playstation 4 lying around. We finished watching The Legend of Korra that weekend on Barry's new TV, and then Barry spent most of Sunday playing board games with four of his friends while I did a little more weeding in Barry's back yard. It was a quiet weekend. Between the two weekends, there was a little flurry of discussion in which I made plans to probably acquire a temporary roommate this spring. Barry has a friend of several years who has a girlfriend of several months who needs a temporary place to stay in Marysville while working at the nearby air force base. I've met her several times, played board games with her, and thought she seemed very nice, so I offered to rent her a room of my house. Well, first I agonized a bit over whether it would be a terrible idea to make such an offer, because I've never had a roommate before. But after consulting with two different friends of mine who are landladies, I decided I was comfortable with it and made the offer. I still need to move some stuff out of that room, see if I can locate the key that goes to that doorknob, and prepare a rental agreement, and also I assume she'll want to come look at the place before she makes a final decision to move in. But I set a price for her and sent her a link to a map and some pictures and description of the place, and it seems like she'll be moving in. It should be for about two or three months, and she might be working night shifts, and she'll probably have weekends on different days than I do, and we'll each probably be spending our weekends with our respective boyfriends, so we may not actually see that much of each other. Anyway, it will be interesting to see how it goes. And if for some reason it goes badly, it should be over before very long. Also there was a bit of local news on Tuesday when the main, concrete-lined spillway at nearby Lake Oroville developed a hole in the concrete. This was a bit alarming to all the local people, and I was following the story each day, looking at new pictures and video of the hole, but the experts seemed to be handling the situation. Things did start to sound a little more worrisome as the weekend approached, because it was decided that the water level in the reservoir would be allowed to rise enough to start spilling over the emergency spillway on Saturday. The emergency spillway had never been used before in the whole history of the reservoir. Unlike the regular spillway, the emergency spillway is not lined with concrete - it's just a dirt hillside - and is not gated - there's no way to stop the water from spilling over it except by lowering the lake level below the height of the emergency spillway. Anyway, I saw somewhere on Friday that if a problem developed with the emergency spillway, it would most likely develop on Saturday, so I was bearing that warning in the back of my mind throughout this past weekend. This past weekend started out quietly. Barry and I planned to spend Friday evening through Sunday evening at my house and then, because I had taken Monday and Tuesday off work, to spend Monday and Tuesday at Barry's house. Barry arrived around midnight Friday night. On Sunday we went to Marysville's Second Annual Historic Faire, which involved going on guided tours of the Mary Aaron Museum and Marysville's Chinatown. It wasn't the best tour of Marysville's Chinatown that I've been on, but it was worth taking Barry on it. Afterward we ate lunch at the Szechuan Chinese restaurant. I ordered the almond chicken, which was okay, although I only ate about half of it. We took the other half home, and I let Barry eat it. There were a lot of carrots and squash and bamboo in it, all of which were acceptably edible in my book, but not especially enticing - I ate them while I was hungry and lost interest in them as soon as I was a little less hungry. On Sunday we watched Enterprise and Barry glued pieces of wood together to make stuff for his customers. Around 5:00 p.m., I noticed on the Internet that low-lying areas of the city of Oroville were being evacuated. This was disturbing, but I didn't see any details about what exactly was going on. Anyway, Oroville is half an hour's drive north of Marysville, and Marysville was not being evacuated. I quickly put the news out of my mind, and we continued watching Enterprise in my living room. The blinds in my living-room window were cracked slightly open, and at one point I noticed a fire truck coming down the street and commented on this to Barry. I also noticed a car behaving kind of oddly, stopping in front of my house with its lights on, and I commented on that too. Barry commented that there seemed to be unusually heavy traffic in front of my house. I still didn't give it much thought, though, until Barry's dad texted him to ask whether he had heard that Marysville was under a mandatory evacuation order. Barry's dad didn't even realize that Barry was in Marysville with me, but his text was the first we both heard about the evacuation. Barry was actually already packing up to go home anyway, but I had been planning to spend a few more hours taking care of stuff around my house (such as preparing that potential rental room!) before getting on the road to follow him. I was a bit shocked to find out we were being ordered to evacuate. Basically everyone in Sutter County was evacuated, as well as the southern portion of Butte County and the western portion of Yuba County - an estimated total of 188,000 people - because a hole was now developing in the emergency spillway at Lake Oroville. The information we were looking at on the Internet said that the emergency spillway was expected to fail within the hour. This statement had been posted on the page we were looking at 19 minutes before we were looking at it, which implied that the spillway was now expected to fail within 40 minutes. I knew that the water wouldn't arrive at Marysville immediately, but I was not sure how long it would take. And under the circumstances, it didn't seem especially wise to spend ten minutes Googling for further details and trying to verify how fast the water might travel. Barry asked me whether I wanted him to stay and help with anything. I said no, he should just get on the road right away, and I would follow soon afterward. He kissed me, told me he loved me, and got on the road. Then I looked around and tried to figure out what to do next. I felt myself doing some very weird prioritizing as I tried to mentally take in the situation. What do you think you would do if you had just a few minutes to grab whatever is most important to you and rush out of town? Whatever you think you would do, you are probably wrong, because you are probably thinking about it in a non-panicked mindset. When you try to think while in a panicked mindset, thinking doesn't work as well, and you end up spending five minutes brushing your teeth while trying to figure out whether this is really serious enough that you should leave in fifteen minutes or unserious enough that you should take 40 minutes. And then spending ten minutes taping protective seat-coverings to the back seat of your car to protect the seat from your incontinent dog, while wondering all the while whether the ten minutes you're spending on this might cause you to no longer have a dog or a car or a life at all - and yet, if you don't do it, you'll probably have a big mess to clean up later, and you'll probably wish you had done it. I took the time to finish doing that. I started out slow and started to feel more and more urgency as the minutes passed. I started consciously reminding myself that I had a lot to live for, a wonderful boyfriend waiting for me. I had at first planned to let Barry know what time I left my house, as I usually do when I'm coming to visit him, but when I tried to message him, my computer was slow to respond, so I just closed it and got out of there. I grabbed my cat and my dog and my personal laptop and work laptop and two days' worth of clothes, threw us all into the car, and got on the road. I was a little over half an hour behind Barry. Once I actually got on the road and turned on the news on an AM radio station, it became clear that the risk was significantly less immediate than I had initially thought, both because water was no longer flowing over the emergency spillway and also because the experts were reporting it would take at least 24 hours (possibly as long as 36 hours) for floodwaters to travel from Oroville to Marysville. [Edit: That information seems to have been inaccurate, though: detailed simulations here suggest it would take about nine hours for floodwaters from a collapse of the emergency spillway to reach my house.] The mandatory evacuation order had been expanded to the Marysville area at around 5:45, and we had seen it an hour or so later. I got on the road with my pets at 7:30, and by then, the most urgent danger had already passed: officials had released enough water down the damaged main spillway to lower the water levels to the point that water was no longer spilling over the damaged emergency spillway. But by then I was already on the road. Not that I was moving very fast! It took me an hour on Highway 70 just to drive the length of the local high school. I kept wondering, during all that time, whether I should pull over at the next side street, park my car, take my dog with me, and run back home to pack a few more things I now realized I wished I'd brought with me. I didn't pull over, though. Nothing I wished I'd brought with me was really all that urgent. And I didn't want to lose my place in the nightmarish line of stopped cars. There was a stoplight up ahead where a gigantic line of cars from a side road was merging with the gigantic line of cars I was in, and the side road seemed to have a vast advantage. If I'm ever evacuated from Marysville again, I need to try to remember to stay on the side streets as long as I can, and postpone merging onto the highways. And I also need to remember that if the floodwaters are coming from Oroville, it's okay if traffic jams make it take four hours to get out of town, because I should have a good nine hours before the floodwaters arrive in Marysville. It took me nearly two hours to get to the other end of Marysville (a distance I could have traveled on foot in less than half that time, even loaded down with belongings as I was) and a little over four hours to get all the way to Barry's house (which is normally a little under a one-hour drive). Barry made it to his house a bit more quickly than I did, because he had the benefit of a GPS advising him about which side streets to take to avoid the main flow of traffic, but it still took him nearly three hours. If I'm ever evacuated from Marysville again, I also need to have plenty of gas in my car. I'm the kind of person who never lets my car get below a quarter of a tank of gas, and on this particular day I had half a tank of gas in it. I was extremely glad I didn't have any less that that, because the radio was reporting a major run on gasoline at all the nearby gas stations, with huge lines to wait in, and many stations were rationing limited amounts of gas per customer. A quarter of a tank would have been just barely enough to get me to Barry's house under normal circumstances, but with the traffic as backed up as it was tonight, having only a quarter of a tank would have made me extremely worried. Although, in the end, it didn't seem like spending four hours driving to Barry's house actually used up noticeably more gas than spending one hour driving there would have, so I also want to try to keep in mind in the future that sitting in traffic, unable to move for hours does not really seem to use up gas at any noticeable speed. Anyway, eventually I made it to Barry's house. He said that worrying about me while he waited for me to arrive had made him realize how much he loves me. This is similar to other things Barry has said; it is a different type of thing than I would ever say. Barry seems to be taken by surprise when he feels strong emotions, and he also seems to treat these emotions as important guides to base future decision-making upon. Whereas, although I don't generally think of myself as being especially aware of my emotions all the time compared to the average person, I think I must be more aware of my emotions than Barry is of his - and more aware even of Barry's emotions than Barry is himself - because whenever Barry expresses surprise at noticing strong emotions in himself, it seems to me not in any way surprising whatsoever. That is, I am not the least bit surprised that Barry would feel such emotions, and I would also fully expect the same emotions in myself and feel equally unsurprised by them there. But also, perhaps more importantly, I do not tend to treat my emotions as important guides to base future decision-making upon. The question of what feelings I actually feel tends to seem to me largely irrelevant to my decision-making; when making serious and important decisions, I'm far more likely to base such decisions on an intellectual analysis of what emotions I feel I'm justified in having, rather than on a gut-level assessment of what emotions I actually do feel, because my first instinct in reacting to my own emotions tends to be a certain wariness of being overly influenced by them. That is, it is easy to sympathize with anyone who pours out a sob story, but if you give in to every sob story you hear, you may get swindled by a lot of con artists. I can't say, however, that my wariness of trusting my emotions has seemed to make me particularly immune to being manipulated; if anything, I'd say I'm more easily manipulated than the average person. But it's possible that I'd be even more easily manipulated if I were more inclined to trust my emotions; it's unclear (to me, anyway) whether my vulnerabilities arise mainly from being distrustful of my emotions when trusting them more might sometimes offer important insights or whether my vulnerabilities arise mainly from simply having strong emotions. Anyway, I was glad to be safe with Barry at his house. Barry's parents took us out to lunch on Monday, and then we went to pick up Heathcliff - Barry's new laser. Barry's old laser arrived in a cardboard box wooden crate with the name "Cathy" inexplicably written on it, so the laser became known as Cathy. Barry recently decided to buy a second laser, the same size as the first, to increase his production capacity, so he was seeking a name for it. He thought it should be the name of a cartoon character, since Cathy is the name of a cartoon character, but his mom suggested Heathcliff because Cathy and Heathcliff are the names of the couple in Wuthering Heights. I approved of this suggestion and pointed out that Heathcliff is also the name of a cartoon cat. The new laser is now named Heathcliff. Anyway, I went with Barry and his dad to the U-Haul place to rent a trailer to pick up the new laser in, but the electrical connections in Barry's dad's SUV failed to work properly with the taillights on the trailer, so they had to hook up the rented trailer to Barry's pickup truck instead. The pickup truck only has seats for two people, so I stayed at Barry's house while Barry and his dad went to pick up Heathcliff. Then I helped Barry remove the plastic wrap from around Heathcliff. Heathcliff still isn't quite operational yet, because Barry needs to finish installing some ductwork to vent the exhaust out of the garage, but he's getting there. Barry and his parents joked about my status as an evacuee; Barry called me a refugee and warned that the president would like to deport me to Syria. It was strange to see news reports about evacuees and realize I was one of them. It's like being a minor celebrity, but not in a good way, and in my case, not in a particularly significant way at all. I must have been one of the least inconvenienced evacuees ever, because "evacuating" for me only ended up meaning that I left my house for Barry's house a few hours earlier than I'd planned to, and brought my pets with me when I otherwise would have left them at home. The mandatory evacuation orders were lifted on Tuesday afternoon, so I went home Tuesday evening at the same time I'd previously planned. For Valentine's Day, I gave Barry two heart-shaped boxes of candy and a red box, about 3" × 3" × 3", decorated with Valentine stickers and filled with similarly decorated hearts cut out of wrapping paper, with little one-sentence reasons on each of them saying why I love him. There was a total of 25 reasons in the box, and enough stickers on each of them to make those 25 paper hearts fill up most of the space in a 3" high box. Also Barry's cats gave him a Valentine's Day card, which I may have assisted them in picking out and signing. 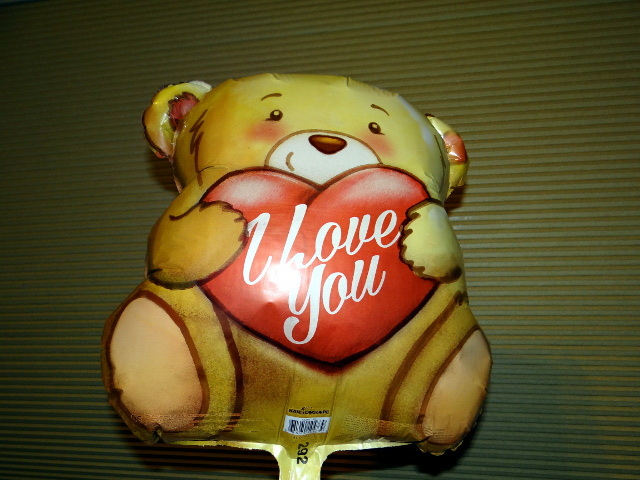 Barry gave me a heart-shaped box of candy, a bunch of strawberries dipped in white chocolate, and a helium-filled balloon with a picture of a bear holding a heart that says "I Love You" on it. Also he showed me a game he is building for me out of wood, resembling a board game I liked when we played it before. Barry had asked me questions in advance about what kinds of things I wanted for Valentine's Day, and I had advised him to go for visual impact: "Go into the store, look around, and see what catches your eye first. Buy that." This is how he ended up buying the balloon and a heart-shaped box of chocolates that was purple. I feel that this strategy worked out well. The fact that one heart-shaped box of chocolates was purple was a good reason to buy me that one rather than another one, and the bear balloon is perfect because Barry's name is Beary (and also Berry and Beri and other variations . . .) and Barry is a bear. I think too many people treat Valentine's Day as a time to spend a ton of money buying generic, personality-less presents, and I think the best presents, especially on Valentine's Day, are more about personality, less about money. Which is why, when shopping for Valentine's Day stuff for Barry, I went to the dollar store and bought a bunch of heart-shaped stickers and resolved to make something out of them (and I did). This was sort of our first Valentine's Day together and sort of our second, because last year on Valentine's Day we'd been corresponding obsessively for three weeks, but we had agreed not to meet in person for another month and a half. (Last year I sent him a copy of a picture of him, with a heart-shaped frame around his face; he sent me a picture of me with a different heart-shaped frame around my face.) Things were looking promising, but there was still a potential for them to be derailed before we even met. I am glad we stuck together and actually met. Although I'm back in Marysville now, the situation at Oroville Dam is still a bit iffy and seems likely to remain so until the end of the rainy season. I expect to be coming and going a bit, and keeping more of my stuff at Barry's house than usual so as to protect it in case Marysville does flood. There is another rainstorm expected on Thursday, and if another mandatory evacuation order is issued, I hope to be better prepared for the next one.